Yucatán is one of the 31 states of Mexico, located in the north of the Yucatán Peninsula. It is bound to the north by the Gulf of Mexico, to the east and southeast by the state of Quintana Roo, and to the southwest and west by the state of Campeche. The capital city and chief commercial center of Yucatán is Mérida. When Yucatán became a state in 1824 it occupied the entire peninsula. 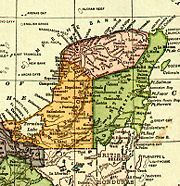 Following a series of insurrections, its territory was reduced with the ratification of Campeche state in 1857 and Quintana Roo in 1902. Prior to Spanish colonization, the area was a center of Mayan and Olmec civilization. The indigenous peoples resisted Spanish conquest from 1527 until 1546, when the peninsula fell to European dominion. A number of ancient Mayan cities were built over by the Spanish and are still occupied today. Others, such as Chichen Itza and Uxmal have been excavated and stand today as reminders of the great civilizations that created them; each has been designated a UNESCO World Heritage Site, in 1988 and 1996, respectively. 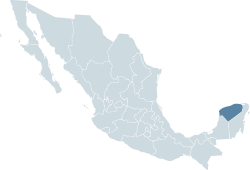 The State of Yucatán is located on the Yucatán Peninsula. It borders the states of Campeche to the southwest, Quintana Roo to the east and southeast, and the Gulf of Mexico to the north and west. The state’s topography includes coastal wetlands, semiarid hills and plains, and limestone lowlands dotted with cenotes (water-filled sinkholes). Yucatán is relatively flat, with the exception of the Puuc hills, the large karstic range of hills in the southern portion of the state. The Puuc hills extend into northern Campeche and western Quintana Roo. Like much of the Caribbean, the peninsula lies within the Atlantic Hurricane Belt, and with its almost uniformly flat terrain it is unsheltered from large storms coming from the east. Strong storms called nortes can quickly descend on the Yucatán Peninsula any time of year. Although these storms pummel the area with heavy rains and high winds, they tend to be short-lived, most often clearing after about an hour. The average percentage of days with rain per month ranges from a monthly low of 7 percent in April to a high of 25 percent in October. Breezes can have a cooling effect while humidity is generally high, particularly in the remaining rainforest areas. The entire peninsula is the surface exposed portion of the larger Yucatán Platform, all of which is composed of carbonate and soluble rocks, being mostly limestone although dolomite and evaporites are also present at various depths. The whole of the Yucatán peninsula is a karst landscape. Sinkholes, locally called cenotes are widespread in the northern lowlands. According to the Alvarez hypothesis, the Yucatán Peninsula was the site of an ancient asteroid impact which is likely to have caused the mass extinction at the end of the Cretaceous Period. The Chicxulub Crater is centered off the north coast of the modern town of Chicxulub. The now-famous "Ring of Cenotes" (visible in NASA imagery) outlines one of the shock-waves from this impact in the rock aged ~65 million years. The ring lies more than 1 km below the modern ground surface, with the rock above the impact strata all being younger in age. The deeply buried impact crater is observed and defined through mass spectrometers and digital radar imagers. Before the arrival of the Spanish in the area, Yucatán was the home of the Maya civilization, and in particular the Yucatecan Maya people. Archaeological remains show ceremonial Mesoamerican architecture dating back some 3,000 years; some Maya hieroglyphic inscriptions found in the area date back to the Maya Preclassic period (200 B.C.E.). Maya cities of Yucatán continued to flourish after the central and southern lowland Classic period. Maya cities collapsed (c. 900 C.E. 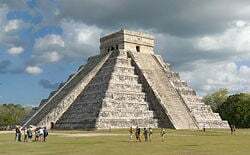 ), including the Puuc flourescence during the Terminal Classic, the rise of Chichen Itza, and the subsequent rise of other sites, such as Mayapan (during the Postclassic). Several sites continued to be occupied up until and beyond the sixteenth -century arrival of the Spanish. The ruins of well over a hundred Maya sites of varying sizes can still be found on the peninsula, such as Chichen Itza and Uxmal, though most sites have not been extensively investigated. Other important ancient Maya cities were built over by the Spanish. Their sites are still occupied today, including Izamal (Itsmal in Yucatecan Maya) and Mérida (T'ho in Yucatecan Maya). According to Hernán Cortés' first letter (Cartas de relación) to the King of Spain, "Yucatan" represents a mis-naming of the land by his political antagonist Diego Velázquez. Cortés alleges that when Velazquez initially landed in Yucatan and asked about the name of the well-populated land, the indigenous people answered, "We don't understand your language." This was supposedly rendered as Yucatan by the Spaniards, who were unfamiliar with the phonetics of Mayan. However, there was political antagonism between Cortés and Velázquez, and this story evidently represents an attempt to defame Velázquez. The actual source of the name "Yucatan" is the Nahuatl (Aztec) word Yokatlān, "place of richness." Diego de Landa, Bishop of Yucatán, left future generations with a mixed legacy in his writings, which contain much valuable information on pre-Columbian Maya civilization, and his actions which destroyed much of that civilization's history, literature, and traditions. Three Spanish expeditions explored the coastal areas of Yucatan from 1517 to 1519, but no major effort was made to conquer the country until 1527 when the first expedition under Francisco de Montejo landed with Spanish crown authority to conquer and colonize Yucatán. While the chiefs of some states quickly pledged allegiance to the Spanish crown, others waged war against the Spanish. Montejo was forced to retreat from Yucatán in 1528. He returned with a large force in 1531, briefly established a capital at Chichén Itzá, but was again driven from the land in 1535. Montejo turned over his rights to his son, also named Francisco, who invaded Yucatán with a large force in 1540. In 1542, the younger Montejo set up his capital in the Maya city of T'ho, which he renamed Mérida. The lord (also known as Tutul Xiu in the Yucatec Maya language) of Mani converted to Roman Catholicism and became an ally, which greatly assisted in the conquest of the remainder of the peninsula. When the Spanish and Xiu defeated an army of the combined forces of the states of eastern Yucatán in 1546, the conquest was officially complete. As of 1564, Yucatan became a captaincy general and from 1786 an intendencia, as a result of the Bourbon Reforms in the administration of the Indies. The Spaniards were granted land and natives to work it for their benefit. Priests and monks set to bringing the population into the Roman Catholic Church. 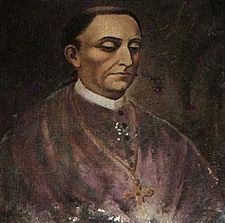 The first bishop of Yucatán, Diego de Landa, burned all the Maya codices that could be located, saying "they contained nothing but the lies of the Devil," and suppressed any remnants of pagan beliefs with such vigor that he was for a time recalled to Spain to answer charges of improper harshness. The book he wrote (in the 1560s) in his defense, Relación de las cosas de Yucatán ("Relation of the Things of Yucatán"), is one of the single-most detailed accounts of Yucatán and of indigenous life from the time of the Conquest. Segments of this work would prove to be of instrumental value in the much-later decipherment of the pre-Columbian Maya writing system. While the Maya embraced Christianity, many took it on as an addition to, rather than a replacement of, pre-Columbian beliefs, and some Christian Maya continue to offer prayers to the ancient agricultural deities in addition to the Christian God and saints. Flag of the Sovereign Nation of the Republic of Yucatán, 1840s. In February 1821, with the conclusion of its War of Independence, Mexico achieved independence from Spain. On November 2 of that year, Yucatán became part of independent Mexico, originally as part of Iturbide's short-lived Empire and later as one of the United Mexican States when a federal, republican system of government was adopted. The state of Yucatán under the newly enacted 1824 Constitution at that time included the territory of what are now the states of Campeche and Quintana Roo as well. In 1835, a conservative unitary system of government was instituted in Mexico; a centralized dictatorship brought forth and held by the then-President, Santa Anna. Yucatán became a department, and authority was imposed from the center. Discontent increased and an insurrection erupted in Tizimín in May 1838, advocating Yucatecan independence. In 1840, the local Congress approved a declaration of independence of Yucatán. At first, Governor Santiago Méndez blocked it, saying that Yucatán would again recognize the rule of the central government in Mexico City if the Mexican Constitution of 1824 were reinstated. Andrés Quintana Roo, sent to Mérida in 1841 by President Antonio López de Santa Anna, succeeded in settling the differences and signed a treaty with the local government. But when Santa Anna later ignored the provisions of this treaty, hostilities resumed, and Governor Méndez ordered all Mexican flags removed from Yucatecan buildings in favor of the flag of the "sovereign nation of the Republic of Yucatán," two red and one white stripe, with a quincunx of stars in a green field. The Yucatecan Constitution was modeled in part on the 1824 Mexican Constitution and the Yucatán state constitution of 1825. Santa Anna refused to recognize Yucatán's independence as he barred Yucatecan ships and commerce in Mexico and ordered Yucatán's ports blockaded. He sent an army to invade Yucatán in 1843. The Yucatecans defeated the Mexican force, but the loss of economic ties to Mexico deeply hurt Yucatecan commerce. Yucatán's governor Miguel Barbachano decided to use the victory as a time to negotiate with Santa Anna's government from a position of strength. It was agreed that Yucatán would rejoin Mexico so long as various assurances of right to self-rule and adherence to the 1825 Constitution within the Peninsula were observed by Mexico City. The treaty reincorporating Yucatán into Mexico was signed in December 1843. Once more, the central government rescinded earlier concessions and in 1845 Yucatán again renounced the Mexican government, declaring independence effective January 1, 1846. When the Mexican-American War broke out, Yucatán declared its neutrality. In 1847 the so-called "Caste War" broke out, a major revolt of the Maya people against the Hispanic population in political and economic control. At one point in 1848, this revolt was successful to the point of driving all Hispanic Yucatecans out of almost the entire peninsula other than the walled cities of Mérida and Campeche. The government in Mérida appealed for foreign help in suppressing the revolt, with Governor Méndez taking the extraordinary step of sending identical letters to Britain, Spain, and the United States, offering sovereignty over Yucatán to whatever nation first provided sufficient aid to quash the Maya revolt. The proposal received serious attention in Washington, D.C.—the Yucatecan ambassador was received by US President James K. Polk and the matter was debated in the Congress, with no action taken other than an invocation of the Monroe Doctrine to warn off any European power from interfering in the peninsula. After the end of the Mexican-American War, Governor Barbachano appealed to Mexican President José Joaquín de Herrera for help in suppressing the revolt, and in exchange Yucatán again recognized the central government's authority. Yucatán was again reunited with Mexico on August 17, 1848. In 1857 Campeche broke off from Yucatán to become a separate state. On November 24, 1902, President Porfirio Díaz proclaimed the creation of the territory of Quintana Roo, separating that territory from the state of Yucatán. Sisal for making rope was probably the first major export crop of the Yucatán Peninsula. The region prospered from this lucrative crop until alternative rope materials came into wider use after World War I, and henequen (sometimes called "green gold") was planted in other places around the world, setting up competing industries. The decades of the henequen boom was a fairly progressive era for Yucatán; the city of Mérida had electric streetlights and trolley cars before Mexico City. It is said there were more millionaires in Mérida at that time than anywhere else in the Americas. Today, the Paseo de Montejo, an avenue patterned after the Champs-Élysées in Paris, is lined with both abandoned and renovated mansions from that era. In addition, the Yucatan countryside has over 300 haciendas, also built during that time, which are in varying states of disrepair and renovation. Until the mid-twentieth century most of Yucatán's contact with the outside world was by sea; trade with the United States and Cuba, as well as with Europe and other Caribbean islands, was more significant than that with the rest of Mexico. In the 1950s Yucatán was linked to the rest of Mexico by railway, followed by highway in the 1960s, ending the region's comparative isolation. Today Yucatán continues to demonstrate a unique culture from the rest of Mexico, including its own style of food, which is a combination of influences from the local Mayan culture, as well as Caribbean, Mexican, European (French) and Middle Eastern cultures. The Constitution of the State of Yucatán provides that the government of Yucatán, like the government of every other state in Mexico, consists of three powers: the executive, the legislative and the judiciary. The State of Yucatán is divided into 106 municipalities, each headed by a municipal president (mayor). Usually municipalities are named after the city that serves as municipal seat, for example the municipal seat of the Municipality of Mérida is the City of Mérida. View of modern-day Mérida, which was built on the site of the Maya city of T'ho. The major cities in Yucatán are Mérida, Progreso, Tizimín, and Valladolid. Mérida is the capital and largest city of Yucatán and the Yucatan Peninsula. Located in the northwest part of the state, it was built on the site of the Maya city of T'ho (also known as Ichcaanzihó or "city of the five hills," referring to five pyramids) which had been a center of Mayan culture and activity for centuries. Tizimín, Yucatán's second largest city, is located in the northeastern section of the state. The word "Tizimin" means "tapir" in the Maya language. With the Spanish conquest of Yucatán, Tizimín was established as a Spanish colonial town in 1544. Valladolid, the third largest city, is located in the southeast. Named for the former capital of Spain, it was first established in May 1543 and moved to its present location in March 1545. It sits atop a Maya town called Zaci or Zaci- Val, whose buildings were dismantled to reuse the stones to build the Spanish Colonial town. Progreso is a port city located on the Gulf of Mexico in the northwest of the state. The city is a center for both the fishing industry and the container industry. During the summer months, Progreso's beaches fill with thousands of mostly local (Mérida) tourists, who spend the summer in the cooler seaside environment. Ruins of Mayapan; following the decline of Chichen Itza's hegemony, regional power in the Yucatán shifted to a new center at Mayapan. Two of Yucatán's historic sites have been designated UNESCO World Heritage Sites, Uxmal and Chichen Itza. Maya chronicles say that Uxmal was founded about 500 C.E. by Hun Uitzil Chac Tutul Xiu. For generations Uxmal was ruled over by the Xiu family, was the most powerful site in western Yucatan, and for a while in alliance with Chichen Itza dominated all of the northern Maya area. Sometime after about 1200 no new major construction seems to have been made at Uxmal, possibly related to the fall of Uxmal's ally Chichen Itza and the shift of power in Yucatan to Mayapan. The Xiu moved their capital to Maní, and the population of Uxmal declined. After the Spanish conquest of Yucatán (in which the Xiu allied themselves with the Spanish), early colonial documents suggest that Uxmal was still an inhabited place of some importance into the 1550s, but no Spanish town was built here and Uxmal was soon after largely abandoned. Chichen Itza rose to regional prominence in roughly 600 C.E. It was, however in the period 900-1000 C.E. that the site became a major regional capital, centralizing and dominating political, sociocultural, economic, and ideological life in the northern Maya lowlands. The ascension of Chichen Itza roughly correlates with the decline and fragmentation of the major centers of the southern Maya lowlands, such as Tikal. Some ethnohistoric sources claim that in about 987 a Toltec king named Topiltzin Ce Acatl Quetzalcoatl arrived here with an army from central Mexico, and with local Maya allies made Chichen Itza his capital. The art and architecture from this period shows an interesting mix of Maya and Toltec styles. UNESCO has recognized the outstanding value of these sites as representatives of Mayan and Toltec cultures. The archaeological remains of these ancient cities demonstrate the social and economic structure of late Mayan society. This page was last modified on 7 July 2013, at 21:08.